Identification and biology of the alfalfa weevil is discussed. When and how to scout, and use of economic thresholds for making management decisions. Integrated Pest Management (IPM) strategies are discussed including biological control, cultural control and insecticidal control. The alfalfa weevil, Hypera postica(Gyllenhal) (Coleoptera: Curculionidae), is found throughout the U.S. and is the major insect pest of alfalfa in North Dakota. Loss of plant biomass, especially leaf tissue, can be severe. Leaf feeding by alfalfa weevil also reduces nutritional quality and digestibility. Depending on the year, yield loss due to alfalfa weevil can approach 100 percent, especially under drought conditions. Adults (Fig. 1) are about 5 millimeters (mm) long (¼ inch), with elbowed, clubbed antennae and a blunt snout. Adults are brown with short, somewhat thick golden hairs over the body and a distinctive brown stripe longitudinally along the center of the back. Newly deposited eggs (Fig. 2) are cream colored, and eggs that are about to hatch are olive brown, with the black head capsule of the developing larva visible. Mature larvae (Fig. 3) are about 8 mm long (almost 3/8 inch) and have a black head capsule and a wrinkled green body with a white stripe running lengthwise along the top. Younger larvae are similar in appearance but smaller. Alfalfa weevil has one complete generation per year in North Dakota. Adults become active from May through June, and females lay eggs in alfalfa stems. Eggs hatch in one to two weeks. Larvae emerge from the stem and begin feeding on the growing tips of the alfalfa plants. 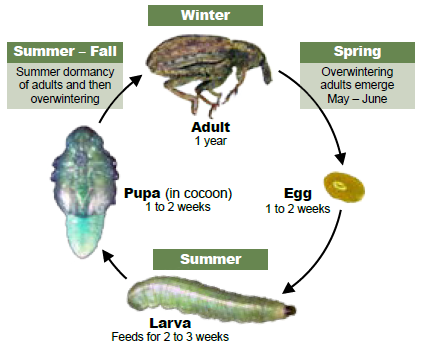 Larvae pass through four growth stages (instars) before reaching maturity. Larvae continue to feed on tender leaf tissue as they grow (Fig. 5). Mature larvae feed for two to three weeks before pupating (Fig. 6). Pupation takes place in small, silken cocoons that are spun near the base of the plant. Adults emerge after one to two weeks. Adults feed in the alfalfa for two to three weeks before leaving for sheltered areas and entering a summer dormancy period (aestivation). Some adults may move back to alfalfa in the fall and lay eggs, but these eggs usually do not overwinter successfully in North Dakota. However, during exceptionally mild winters such as we experienced during the winter of 2011-12, winter egg survival may lead to spring larval emergence and damage occurring earlier than normal the following spring. These adults will overwinter in shelterbelts outside the alfalfa field, and then continue their life cycle the following year. Alfalfa weevil development is temperature-dependent, and degree day models have been developed for alfalfa weevil growth. 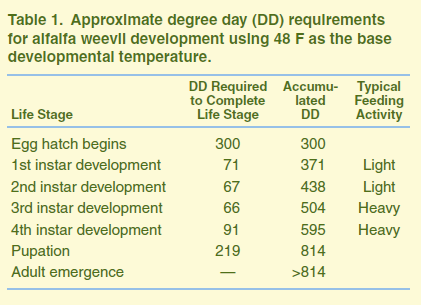 The following degree day table has been adopted by university Extension specialists in our region (for example, University of Wisconsin, University of Illinois) and was derived from the model developed by Harcourt (1981) for alfalfa weevil in southern Ontario. The following model assumes no overwintering egg survival. For most years, degree days toward alfalfa weevil development do not begin to accumulate before March 1. Be sure to check the weekly NDSU Extension Service “Crop & Pest Report” during the growing season for statewide alfalfa weevil degree day maps. Or you can generate your own by visiting the NDAWN website. Go to “Applications,” select “Insect Degree Days” and choose “Maps.” March 1 is used as the start date, select 48 F as the base temperature and click “Submit” to generate the map. You also can generate accumulated degree day tables for individual weather stations. Initial feeding injury by first-instar larvae appears as pinholes in the terminal leaves. As the plants and larvae grow, feeding injury will progress throughout the plant leaves, with leaves becoming skeletonized as feeding injury becomes more severe (Figs. 7 and 8). Typically, third- and fourth-instar larvae cause the most feeding injury. Plant growth up to the first cutting usually suffers the greatest feeding injury, although crown injury to regrowth can become significant, particularly under windrows where larvae take shelter after the first cutting. Integrating the degree-day model into your alfalfa weevil management program is important. Accumulated degree days will give you a time to begin scouting, when damage might occur and when control action might be necessary. Scouting should begin immediately after egg hatch, and fields should be scouted weekly up through the first cutting. Fields should be scouted in an “M” pattern or by selecting random sites in the field, with a minimum of five sampling sites per field. Larger fields should have more sampling sites. Be sure your sampling pattern is representative of the entire field. Don’t scout only along the edges or in small areas. Using a system of aerial imagery of your field, global positioning system (GPS) coordinates (which are available through Google Earth) and a hand-held GPS unit will allow you to set up your scouting routes and locate sampling sites before you scout. For sampling prior to the first cutting, you will need sharp pruning shears; a clean, white 5-gallon bucket; a hand lens; a yardstick for measuring plant height; and pencil, paper and a calculator. At each sampling site in the field, select a minimum of 30 stems and cut them off at the base. Invert the cut stems into the 5-gallon pail and vigorously beat the plants in the pail to dislodge the larvae. First-instar larvae feeding in rolled leaf tips won’t dislodge easily, so be sure to examine leaf tips for larvae. Count and record 1) the number of stems sampled, 2) the total number of larvae counted and 3) the height of the alfalfa at the sampling sites. Repeat this procedure for all sampling sites within the field. When finished, total the numbers of larvae found and divide by the total number of stems sampled to calculate an average number of larvae per stem for the entire field (Fig. 9). Also calculate average plant height for the field. An alternative, though less accurate, scouting method is to make visual defoliation estimates at each sampling site in the field using the same field scouting pattern as described above. Defoliation estimates should be recorded as percent defoliation, and an average should be calculated for the entire field. Keep in mind that this method, while time efficient, can lead to overestimation or underestimation of actual damage, and estimates can vary significantly among different observers. We do not recommend the use of sweep nets for sampling because results are often highly variable and inaccurate. Sweep nets can be used to determine the presence/absence of alfalfa weevil adults and larvae in a field at or prior to typical egg hatch (300 DD). After alfalfa weevil has been detected, the stem sampling method should be used. Several factors must be considered when making alfalfa weevil management decisions. Plant height, estimated yield, crop market value, management costs and plant injury based on the number of larvae per stem must be considered. Studies conducted in Kentucky, Nebraska, New York and Utah have demonstrated that the level of plant damage per insect varies with geographic area. No detailed research on alfalfa weevil damage has been conducted in North Dakota. The following economic threshold table is based on simulated third- and fourth-instar larvae damage levels observed in a two-year study conducted in Nebraska in 1990 and 1991 (Peterson et al. 1993) and has been adapted for North Dakota. Threshold numbers in Table 2 are the average number of larvae per stem sampled in the field using the 30-stem sampling method described above. These economic thresholds apply prior to the first cutting only (Table 2). After the first cutting has been harvested, be sure to scout for larvae under the windrows. Larvae that escaped the first cutting tend to move under the windrows for shelter and will feed in these locations (Fig 10). Check regrowth for larval feeding. If eight or more larvae per square foot are found or regrowth is delayed due to feeding, treatment is recommended. If using the visual percent defoliation method, treatment is recommended when percent defoliation reaches an average of 30 percent for the entire field. Keep in mind that this threshold is less accurate than the threshold based on larval counts, and does not take into account forage value or application costs. A few parasitic wasp species, including Anaphes luna, Bathyplectes anurus, B. curculionis and Oomyzus incertus, have been introduced in the U.S. to control alfalfa weevil. Limited surveys of the natural enemies of alfalfa weevil have been conducted in North Dakota. A fungal pathogen, Zoophthora phytonomi, also provides natural control of larvae, but it is most effective only in warm and moist environments and, as such, likely is not an important biological control agent of alfalfa weevil in North Dakota. A study by Tatyana Rand of the U.S. Department of Agriculture-Agricultural Research Service Laboratory in Sidney, Mont., found an average parasitism rate by B. curculionis of 37.2 percent in the North Dakota/Montana border region. Natural enemies have the potential to keep alfalfa weevil from reaching economic levels. Therefore, insecticides should be used only when necessary. Cutting typically occurs soon after alfalfa reaches the early bud stage. At this time, continued feeding by larvae may not be great enough to warrant the cost of insecticide application. Early cutting is recommended when alfalfa has reached 50 percent budding and alfalfa weevil larvae have reached the economic threshold. If economic alfalfa weevil infestations are observed, early cutting (hay) is one of the best strategies for mitigating alfalfa weevil damage. Bale windrowed alfalfa as soon as possible to expose larvae that are sheltering under the windrows. Another cultural control strategy is to maintain stand health through recommended agronomic practices. Please refer to NDSU Extension Service publication R571 (revised), “Alfalfa Management in North Dakota,” for information. When insecticidal control is necessary, pay particular attention to the preharvest intervals (PHI) and pre-grazing intervals (PGI) on the product label. The decision on which product to use should be based on when you intend to cut or graze the crop. Also, note that products that have a long PHI do not necessarily have long residual insect control activity. For example, chlorpyrifos (an organophosphate) applied at greater than 1 pint per acre has a PHI/PGI of 21 days, but residual activity realistically can be expected for only seven days. Zeta-cypermethrin (a pyrethroid) applied at the low or high rate has a PHI/PGI of three days, yet should provide 10 to 14 days of residual control activity. Another important consideration is pollinator safety. Most insecticide labels now carry “bee language” such as “do not apply when crop is in bloom” or “do not apply when bees are actively foraging.” When spraying any insecticide in alfalfa, be sure to observe pollinator safety. Only apply insecticides early in the morning or late in the evening when bees are not present. The following table lists insecticides registered for use in alfalfa in North Dakota for control of alfalfa weevil (Table 3). Trade names are given as examples only and do not imply endorsement of one product over another nor discrimination against any product by NDSU Extension. Bryan, M.D., R.J. Dysart and T.L. Burger. 1993. Releases of introduced parasites of the alfalfa weevil in the United States, pp. 1-203. USDA-APHIS Series, Miscellaneous Publications No. 1504. Cook, K.A., S.T. Ratcliffe, M.E. Grey and K.L. Steffey. 2004. Alfalfa Weevil. Danielson, S., T. Hunt and K. Jarvi. Managing the Alfalfa Weevil. 2006. University of Nebraska-Lincoln Extension, Institute of Natural Resources publication G1208 (revised). Giles, K., J.J. Obrycki, M. Rice, L. Pedigo and S. Barnhart. 1999. Integrated Pest Management of Alfalfa Insects in the Upper Midwest. Leopold Center for Sustainable Agriculture, Publication IPM-58. Iowa State University, Ames. Harcourt, D.G. 1981. A thermal summation model for predicting seasonal occurrence of the alfalfa weevil, Hypera postica (Coleoptera: Curculionidae), in southern Ontario. The Canadian Entomologist 113: 601-605. Peterson, R.K.D., S.D. Danielson and L.G. Higley. 1993. Yield responses of alfalfa to simulated alfalfa weevil injury and development of economic injury levels. Agronomy Journal 85: 595-601. Peterson, R.K.D., and S.J. Meyer. 1995. Relating degree-day accumulations to calendar dates: alfalfa weevil (Coleoptera: Curculionidae) egg hatch in the north central United States. Environmental Entomology 24: 1404-1407. Radcliffe, E.B., and K.L. Flanders. 1998. Biological control of alfalfa weevil in North America. Integrated Pest Management Reviews 3: 225-242. Rand, T. 2013. Host density drives spatial variation in parasitism of the alfalfa weevil, Hypera postica, across dryland and irrigated alfalfa cropping systems. Environmental Entomology 42: 116-122. Printing is being supported by the Great Plains Plant Diagnostic Network grant from a subcontract under the USDA-NIFA.